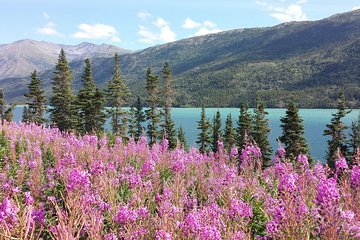 After pickup from Skagway port, board your mini-bus and drive along the Klondike Highway in British Columbia. Amid stunning mountain scenery, pass landmarks including Brackett Wagon Road, WP&YR railroad, Moore Creek Bridge and Pitchfork Falls. During the day, keep watch for moose, bears, birds, sheep, and goats. Ascend 3,292 feet (1003 meters) to White Pass summit, a route that thousands of stampeders journeyed in 1898 during the Gold Rush in search of fortune. Enter Tormented Valley, a subarctic alpine tundra with a beautiful lake. Please note: All passengers must have a valid passport. We will ensure your timely return back to the ship in Skagway for this activity. If your ship is delayed and you are unable to attend this activity, your money will be refunded. See our terms and conditions for full details. Beverly was great. The bus comfortable, the tour was well paced, informative and amazing scenery. 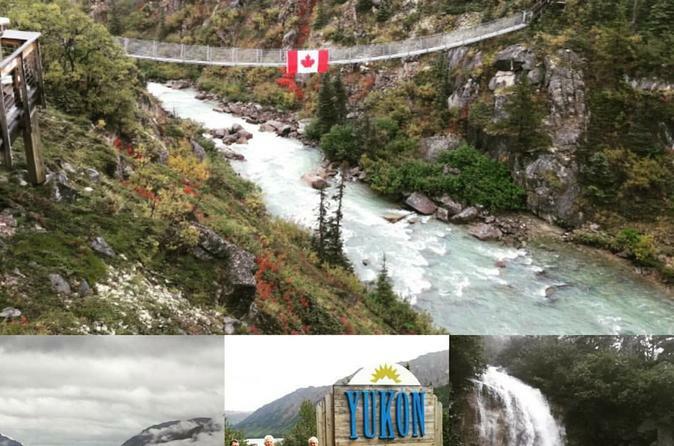 All the way though the Canadian boarder to the Yukon.we were kept amused and entertained with stories of the Gold rush. We saw bear, lakes and mountains in all their splendour. Good value great tour. OUR thanks to all. Saw some nice country, but no animals. Saw narrow walking bridge between US and Canada but didn't get to walk over it. Saw Welcome to the Yukon sign. So what. Definitely not worth the money. Our tour was terrific. Our guide Beverly was knowledgeable and funny and told us all kinds of great stories and history. I had taken the train last time I was in Skagway and the scenery was mostly fogged out. I liked this tour better. We went into Canada and Beverly stopped many times for pictures along the way. Pick up was easy right at the port. The excursion and driver, Max, were excellent. The 28? passenger bus was full, clean, on time and in good shape. Max, our driver, was knowledgeable, friendly and enthusiastic. Really good! Scenery as we drove from Skagway up through White Pass (elevation ~3400 feet), through the alpine environment, past Fraser, then Tutshi Lake, and on to the border of BC and Yukon Territory was beautiful. The return trip back to our ship took about an hour and 20 minutes, Very enjoyable experience. Our guide, Brooke, was fantastic. The scenery was great. We also saw a bear, a moose, mountain goats and Iditarod puppies. The tour was 3x deeper into the frontier and half the price as as the train tour. Also, because we were in a small bus, we stopped for photos a scenic lookouts and of the wild animals we encountered. Very nice. We had a small bus and our driver Tyler was a local man who kept us entertained with information and jokes! He went out of his way to make sure we saw bears etc. Always happy to take photos of us at the borders. A really good trip! Value for money. The driver was very knowledgeable and amiemable, I would recommend this tour to my fellow travelers. If you like taking photos, you'll have plenty of amazing opportunities on this excursion. I highly recommend this tour, our tour guide Brook was the best, we stopped numerous times for pictures, the beauty of this tour was absolutely gorgeous, I felt like I was looking at a postcard. She was very informative about the area. It was worth every penny spent.